At this juncture in history, the fate of Europe is wound up not in ideas but in geopolitics. For millennia, eruptions from Asia have determined the fate of Europe, including invasions and migrations by Russians, Turkic tribes and Byzantine Greeks. Central and Eastern Europe, with their geographical proximity to the Asian steppe and the Anatolian land bridge, have borne the brunt of these cataclysms. Today is no different, only it is far subtler. Armies are not marching; rather, hydrocarbons are flowing. For that is the modern face of Russian influence in Europe. To understand the current pressures upon Europe from the east it is necessary to draw a map of energy pipelines. One-quarter of all energy for Europe comes from Russia, but that statistic is an average for the whole continent; thus, as one moves successively from Western Europe to Central Europe to Eastern Europe that percentage rises dramatically. Natural gas is more important than oil in this story, but let us consider oil first. Russia is among the top oil producers worldwide and has among the largest reserves, with vast deposits in both western and eastern Siberia. Crucially, Russia is now investing in the technology necessary to preserve its position as a major energy hub for years and decades to come, though it is an open question whether current production levels can be maintained in the long term. Russia’s primary gateway to Europe for oil (and natural gas) is Belarus in the north and Ukraine in the south. The Druzhba pipeline network takes Russian oil through Belarus to Poland and Germany in the north and in the south through Ukraine to Central Europe and the Balkans, as well as to Italy. Russia certainly has influence in Europe on account of its oil, and has occasionally used its oil as a means of political pressure on Belarus and Ukraine. But moving westward into Europe, negotiations over Russian oil are generally about supply and pricing, not political factors. It is really with natural gas that energy becomes a useful political tool for Russia. Russia is, after the United States, simply the largest producer of natural gas worldwide, with trillions of cubic meters of reserves. Europe gets 25 percent of its natural gas from Russia, though, again, that figure rises dramatically in Central and Eastern Europe; generally, the closer a country is to Russia, the more dependent it is on Russian natural gas. Central Europe (with the exception of Romania, which has its own reserves) draws roughly 70 percent of the natural gas it consumes from Russia. Belarus, Bulgaria and the Baltic states depend on Russia for 90-100 percent of their natural gas needs. Russia has used this dependence to influence these states’ decision-making, offering beneficial terms to states that cooperate with Moscow, while charging higher prices and occasionally cutting off supplies altogether to those that don’t. This translates into real geopolitical power, even if the Warsaw Pact no longer exists. The Yamal pipeline system brings Russian natural gas to Poland and Germany via Belarus. The Blue Stream pipeline network brings Russian natural gas to Turkey. Nord Stream, which was completed in 2011, brings Russian natural gas directly to Germany via the Baltic Sea, cutting out the need for a Belarus-Poland land route. Thus, Belarus and Poland now have less leverage over Russia, even as they are mainly dependent on Russia for their own natural gas supplies by way of separate pipelines. 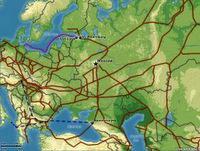 The next major geopolitical piece in this massive network is the proposed South Stream pipeline. South Stream would transport Russian natural gas across the Black Sea to Bulgaria, Serbia, Hungary and Austria, with another line running to Italy via the Balkans and the Adriatic. South Stream could make Central Europe and the Balkans more dependent on Russia, even as Russia does not require Ukraine for the project. This, combined with Nord Stream, helps Russia tighten its grip on Ukraine. But there is also Caspian Sea oil and natural gas to consider, particularly from Azerbaijan, which inhibits Russia’s monopoly. Oil and natural gas pipelines built with the help of Western energy companies in the 2000s bring energy from the Azerbaijani capital of Baku through Georgia to Turkey and onwards to Europe. Furthermore, the Nabucco pipeline network has the potential to bring Caspian Sea natural gas across the Caucasus and Turkey all the way to Austria, with spur lines coming from Iraq and Iran. Obviously, this is a complex and politically fraught project that has not materialized. Winning out over Nabucco has been the Trans-Adriatic Pipeline (TAP), a far less ambitious network that will bring Azerbaijani natural gas across Turkey to Greece and Italy. Because TAP avoids Central Europe and the Balkans, its selection over Nabucco constitutes a clear victory for Russia, which wants Central and Eastern Europe dependent on it and not on Azerbaijan for energy. In fact, Russian political pressure was a factor in TAP’s victory over Nabucco. The real long-term threat to Russian influence in Europe comes less from Azerbaijan than from the building of liquefied natural gas (LNG) terminals. These are facilities located on coastlines that convert LNG back to natural gas after it has been liquefied to enable transport across seas and oceans. With an LNG terminal, a country is less dependent on pipelines emanating from Russia. Poland and Lithuania are building such terminals on the Baltic Sea and Croatia wants to build one on the Adriatic. The Visegrad countries of Hungary, the Czech Republic and Slovakia have been building pipeline interconnectors, in part to integrate with — and take advantage of — these Baltic terminals. This LNG comes from many sources, including North Africa, the Middle East and North America. That is why Russia is deeply concerned about vast shale gas discoveries in the United States and elsewhere in Europe — natural gas that could eventually be exported with the help of LNG terminals to Central and Eastern Europe. Russia is also worried about the European Union’s attempt to break its energy monopoly through legal means. According to new legislation known as the Third Energy Package, which is still in the process of being implemented, one energy company cannot be responsible for production, distribution and sales, because the European Union defines that as a monopoly. And such monopolistic practices actually describe Russian energy companies like Gazprom. If the European Union gets its way, Russian corporate control will be unbundled. Therefore, we forecast that Russia’s use of energy to extract political concessions will weaken over time, but will nevertheless remain formidable in parts of Central and Eastern Europe. While energy has served as an effective tool for Russia to wield political influence in Europe, Moscow is first and foremost concerned about maintaining the revenue from energy exports that has become so crucial for Russia’s own budget and economic stability. In this sense, maintaining European market share (and further developing market share in Asia) takes precedence over political manipulation for Moscow. Consequently, Russia will have to become even more subtle and sophisticated in the way that it deals with its former Soviet republics and Warsaw Pact satellites.